I’m sorry guys, I feel like you must be getting fed up of me. I’ve ruled out the clutch plates being stuck by putting the bike in gear and spinning the rear wheel, then screwing in the adjuster until the clutch releases. All good. With the adjuster screw in, I couldn’t find a point of adjustment where the clutch is fully engaged and fully released, so went back over DR DICKs sticky. The point where he says, ‘with the lever pulled in you should be able to pull the cable off the perch, or the worm is hitting on something’ - well, I couldn’t pull it off. After checking the cable fitting on the Barnett is the same as the OEM, I figured something is up. So I put a small piece of aluminium tape on the worm, and established that it’s hitting the sprocket nut. So the worm isn’t bottoming out enough when it hits the new pin I fitted...I think. Major pain in the arse. I adjusted the cable until I stopped hearing the ‘tink’ when the lever returned to the stop when doing that side of things. I have Chevelle’s new lever, but haven’t fitted it yet, trying to see if I can get the OEM one working just to get the bike on the road, I can’t insure it until it’s roadworthy - however, doing this and timing it at a better location would be one ‘fix’. Or grind the existing lever (and weaken it). Or grind a touch where the sheet metal claw is welded to the worm gear. Need to look at it some more and see how much is needed. Pretty frustrating, was hoping to have it fired up this weekend. Where is the Roll Pin Stop for the Lever? 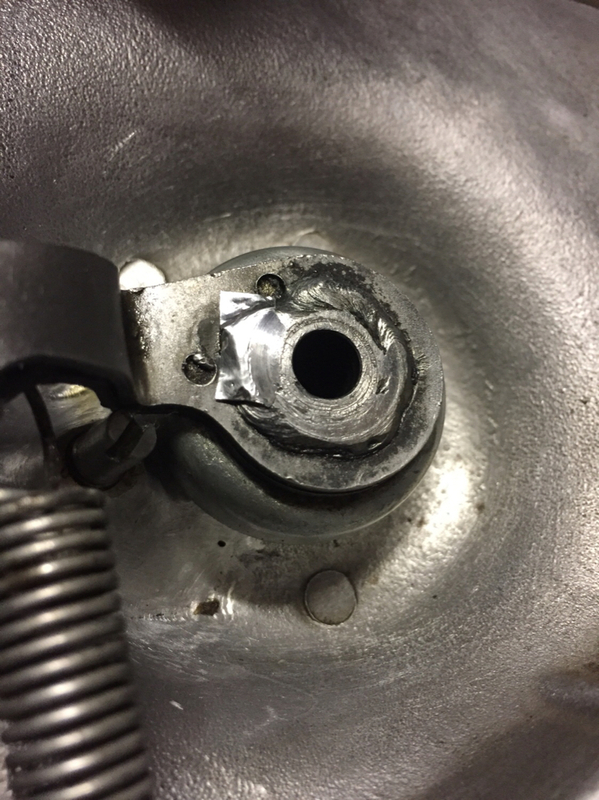 Maybe its the Picture, I Dont See It ..
Long story short, it got messed up (pin was snapped when I got in there) and I wasn’t happy with any of the repair options, so friend who is handier than I am with a tig torch built up the area for me and I profiled it to fit a new screw in pin. It’s a lot beefier than the original, but the old one wouldn’t have snapped off if it had been larger - overkill for something that shouldn’t see any contact, I know, but I’m trying to build an ultra reliable bike (haha) and I only want to mess with this once. Arm should supposedly stop in the same location but looks like I cocked up somewhere. Can grind some off this or set it further back. really dig the out the box thinking!!! Did you ensure sprocket is seated and nut is run down? I have had issue w/ some rod seals that nest in the sprocket nuts not allowing nut to fully seat. Are you by chance running a .050" offset (79-up) sprocket? I would make a alignment mark on grease cup with worm against stop pin. Then remove the stop pin and see if you can get worm to seat further, it should bottom out on the grease cup w/ no pin. Thanks for chiming in Chevelle, I’ll check all of that. 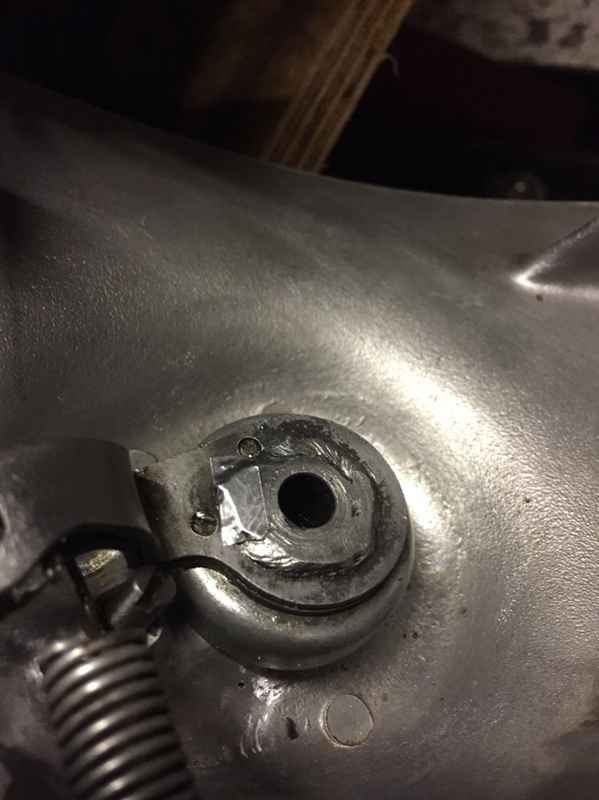 When I shaped the welded area I made sure there was no contact at the lip of the grease shield when it stopped before determining the position for the pin, I think I have some movement before it bottoms out so I can move things back. I do intend to fit your part, but if the original is getting cut off anyway, I might as well make it all work so there is less to worry about when fitting the part. Especially due to having the sprocket cover welded, I use a good guy (steel is my limit) but best to be safe. I think maybe the push rod is too short, but can’t explain why if it worked before. Back to Basics, did you remove the Clutch Derby Cover, ensure a 3/16" measurement from Spring Pressure Ring to the Flat of the Spring Cup? , I would re check, with the cover still off, re adjust the Clutch Rod Screw and Cable, sit on the bike and Pull your lever while looking down to witness the Release disc is moving outward ( disengaging) Evenly, not Cocked, sometimes you need to mix up the springs to get it just right, use a 3/16" drill bit as a gauge..
....a 3/16" hex key works well also. I suggest saving the oem worm lever,they have value I think.buy an aftermarket worm to sacrifice.the only part youll need is the worm gear.the arms are the weak spot on the aftrmkt. Does he have the correct stack of release pushrods?